What Is the Difference Between a Downhill & a Mountain Bike? Downhill mountain biking is a fast-paced segment of mountain biking that takes place on steep courses or off-season ski slopes. Downhill bikes are sturdy and have full suspension with extra travel, making them especially adept at conquering rough terrain at high speeds. Most traditional mountain bikes have little use for the extreme absorption and slacker geometry of a downhill bike, since downhill bikes are usually much heavier than a traditional mountain bike. Downhill bikes are built to withstand extreme punishment. Since downhill races take place at high speeds, avoiding obstacles is difficult, and both bike and rider are prone to take a beating. Thus, the frames are extremely sturdy and are made from high-strength materials, usually steel, titanium, and carbon fiber. Weight isn't of utmost importance for a downhill bike, since most courses have very little climbing. The frames also feature a slacker geometry, which places the rider much farther back. The frames are always full-suspension, with travel for the back wheel to reduce impact and shock. The fork on a downhill bike often features a double crown, which places a second brace at the top of the fork for added rigidity and strength. Downhill bikes usually feature 26-inch instead of 29-inch wheels, since these wheels have smaller rims that provide more structural rigidity. The spoke counts are usually 32 or higher, since more spokes prevent having to true the wheel as often. Downhill bikers usually run their tires at lower pressure to maintain traction on loose surfaces and absorb some impact, and these tires often use a puncture-resistant casing. Like the rest of a downhill bike, the wheels are primarily designed to take punishment without failing. Traditional mountain bikes don't need the bomber construction and extended travel of a downhill bike because they're rarely contending with courses that are quite as steep and treacherous. 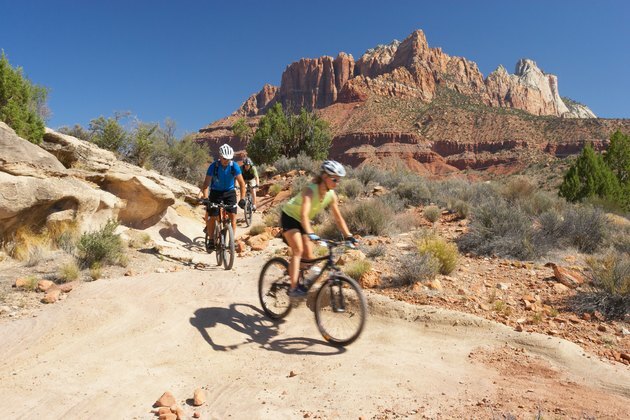 Instead, mountain bikes feature lighter frames and can forgo full suspension for a hardtail or rigid fork, depending on the preference of the rider. These bikes are less capable of absorbing impact, but climb much faster and are easier to maneuver. A traditional mountain bike can also use 29-inch wheels, which roll over obstacles easier (but the trade-off is a slight loss of durability). When you're in the market for a new mountain bike, you'll generally only want to buy a downhill bike if you're specifically and primarily into downhill riding The frame geometry is designed for a downhill slope, making it less than ideal for climbing and casual riding. Traditional mountain bikes keep the rider level, and have enough travel in their suspension to handle most obstacles on a mountain biking trail. They're versatile and ideal for getting into the sport, or for starting in some traditional races. A full suspension mountain bike with traditional geometry is usually versatile enough for almost all conditions. Can You Convert a Racing Bike Into a Comfort Bike?